Ordering an AncestryDNA test kit is very quick and easy, especially if you are already an Ancestry subscriber and are logged into your Ancestry account. 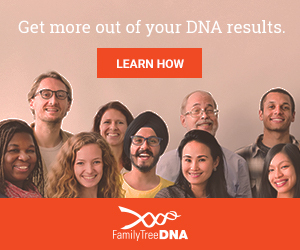 Click on the DNA tab at the top of any Ancestry website page, and you will be taken to the DNA kit order page. If you are already an Ancestry member or subscriber and are logged into your Ancestry account, the first part of the order (the contact details) will be pre-populated with your details as per your Ancestry account details. If you are not already an Ancestry member or subscriber, you will need to register as part of the ordering process. Your contact details will either be pre-populated (if you are logged in) or you should enter them as requested. If the Billing Address is the same as the Shipping Address, leave the checkbox ticked (as above). When you are happy with the order details, click on the orange button to Submit Order. For further information on your AncestryDNA test, including using the results, see my AncestryDNA Quick Reference page.